LAS VEGAS – Much of the joy of covering Floyd Mayweather and Manny Pacquiao fights has long since fizzled. It's the same storyline fight after fight for each man, neither taking the fight that the world wants to see and neither ever coming up with an adequate explanation of why not. On Saturday, Mayweather will defend the WBC welterweight and super welterweight titles at the MGM Grand Garden in a rematch against Marcos Maidana few were hoping to see. Maidana gave Mayweather some early problems in their first fight on May 3, but Mayweather adjusted and cruised to a fairly one-sided victory. It's difficult to envision a scenario in which Maidana could do anything differently that would enable him to close what was in the end a significant gap. A little more than two months after Mayweather's bout, Pacquiao will defend his WBO welterweight title against Chris Algieri in Macau. Similarly, there are few people outside of Algieri's family, friends and team calling to see him fight Pacquiao. Top Rank made the match because, quite literally, there was no one else. Top Rank CEO Bob Arum has tried to talk up the possibility of a Mayweather-Pacquiao fight finally occurring by saying that executives from Showtime and HBO have been discussing the fight. That is not as significant as it may seem, even if a source's assertion to Yahoo Sports is true that Leslie Moonves, the president and CEO of CBS Corporation, was at Arum's Los Angeles home recently to discuss the bout. Yes, the networks have to come to some kind of arrangement, because Showtime has an exclusive deal to broadcast Mayweather fights and HBO has a similar deal to broadcast Pacquiao fights. With the amount of money that would be at stake, one would have to be naïve to doubt that Showtime and HBO would come together and easily make a deal were the fighters to agree. Bank on it: If Mayweather and Pacquiao publicly agree to fight each other, the networks will figure their end of it out. To raise that issue is a red herring, at best, however. Speaking publicly about it at all makes the prospects of getting the fight done more and more unlikely, if it has any prospects at all. The question isn't if they'll fight in the future, because unless there is a major change of heart on a number of sides, the fight isn't going to happen. The better question is: Why hasn't it happened to this point? 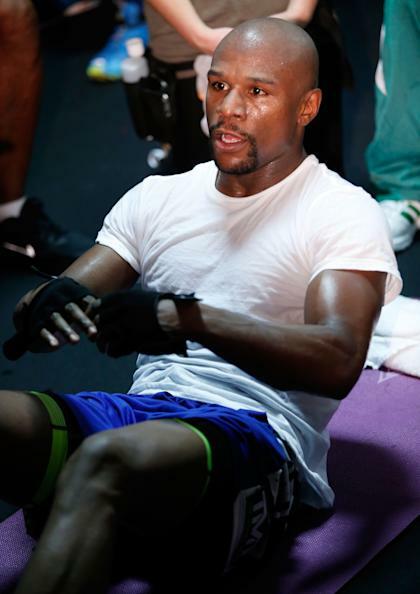 Mayweather would prefer not even to address the issue and keep his focus on selling his rematch with Maidana. Mayweather has plenty on his plate to deal with that will interfere with selling the Maidana bout. The media will descend upon Las Vegas on Tuesday, and talk will undoubtedly be about 50 Cent's claim that he's illiterate, Shantel Jackson's civil suit against him and Arum's claims that talks for not just one but two fights with Pacquiao in 2015 are underway. None of that is appealing to Mayweather, who will want to only talk about handling Maidana. Leonard Ellerbe, the CEO of Mayweather Promotions, beamed when he was asked why the fight hasn't happened. "C'mon," he said, breaking into a laugh. "You know the answer. We all do. That fight hasn't happened because of one man." Ellerbe proceeded to place the blame on Arum, and unquestionably, Arum shares some of the blame. It's ludicrous, though, to suggest that Arum is wholly at fault in this situation, because it goes far beyond one man. Pacquiao clearly abhors talking about Mayweather. After he defeated Brandon Rios in Macau last year, the first question he was asked at the post-fight news conference was whether he'd done enough in the win to make people want to see him fight Mayweather. Instead of using the opportunity to clearly, unequivocally state that he wanted the fight and that he'd agreed to all of Mayweather's demands, Pacquiao visibly sighed and gave an uninspiring answer that left one wondering whether he really was interested at this point. He changed his viewpoint a bit on his 27,000-plus mile media tour to promote his bout with Algieri. In Las Vegas, he sat in the middle of a deserted restaurant, talking with a reporter about corruption in Filipino politics. He was there physically, but his mind was elsewhere. Pacquiao is highly agreeable, but he rarely has much to say to reporters, and on this day, it was no different. 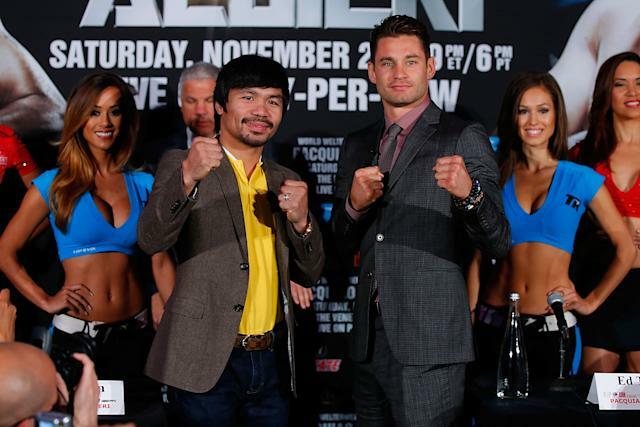 A reporter said, "You must not care about the Algieri fight, because you seem so bored." That caused Pacquiao to chuckle. "We're on this tour and we're doing things and everybody's friends," he said. "But once training camp begins, it will be different." After a long while, a reporter brought up Arum's comments about the executives of Showtime and HBO meeting to try to make the Mayweather fight. Pacquiao nodded and said, "Maybe, finally, this time will be it." There have been so many false starts and stops, it's hard to believe it will ever occur until they're standing across from each other in the ring. Everyone has a reason why it hasn't. Mayweather supporters like to push the fact that their man is the bigger star and should command the most money. That, of course, is a negotiating topic and is mind-boggling that fans would care. One would think that fans would simply want to see the fight and wouldn't care about the percentage split. Mayweather fans, in particular, push Mayweather's agenda that he should get the vast majority of the money from what would surely be the largest-grossing bout in history were it to occur. Pacquiao fans have regularly suggested that Mayweather is afraid. Pacquiao himself gave some credence – sort of – to that theory. "I don't think Floyd is afraid of the fight, but I think he's afraid to lose," Pacquiao said. "That [perfect record] means a lot to him and he doesn't want to fight someone at this point who could give him a loss." Mayweather took the most proactive step in order to get the fight done when on Jan. 18, 2012, two weeks before he announced he was going to fight Miguel Cotto, he called Pacquiao and offered him $40 million to make the fight. That figure was, and remains, more than Pacquiao has ever made. Whether the offer was real can't be known, but it never got far because Pacquiao said he wouldn't accept it without a share in the pay-per-view profits. Ellerbe is astounded Pacquiao took that position. "Even now, Manny Pacquiao will tell you he hasn't made more than 'X' in any fight," Ellerbe said. "So what does that tell you?" Mentioning the fact that he turned down a career-high purse seemed to get a rise out of the normally imperturbable Pacquiao. He leaned forward in his chair and stared his interrogator directly in the eyes with a hard gaze. "This fight isn't about the money to me," Pacquiao said. "I said this before and I'll tell you right now: Take all of the money that we would make and put it [in a pot]. If he wins, he gives the money to a charity he picks. And if I win, I give it to a charity I pick. All of it, every bit. "I will fight him. All the things he asked, I agreed to, but he keeps bringing things up. Forget the money. Let's give it to charity. Let's just give the people the fight they want." It's not fair, though, to raise false hope where there is none. There are too many people with too many opinions and too much invested for this fight to ever occur. The failure to make this fight is a blight on the sport and will forever tarnish the reputation of all those involved.